Naked War is a video game by The Pickford Brothers. It's a fun, turn-based, strategic battle game for two players. • Drive tanks, fly helicopters, ride boats, or just shoot your opponent to bits! • Incredibly easy to play, surprisingly difficult to master, a strategy game for everybody! • Challenge anybody in the world! • Play against opponents even when they are offline! • Pick your team colour and join in the world-wide-battle with each game! 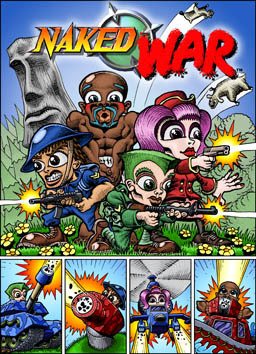 Naked War is distributed exclusively online as a direct download product. Its completely free to download, free to play, and free to register. Try it out for free, today, from this website! What is Naked War, how does it work, and how do I start playing? Free play mode, with infinite Challenges for subscribers! What do we mean when we describe Naked War as a Community Messaging Game or CMG? "It's the game I played most this month and I'd be surprised if I stop anytime in the near future"